Before 1826 church attendance in Woolton meant a six mile round journey to the nearest church in Childwall. However in that year a new chapel was built on a site a little below the present building. Holding around 200 people the church was built of the locally quarried sandstone. The population of Woolton village grew steadily in the 19th century and the church was felt to be too small. The church records indicate that the building was somewhat of an eyesore and built “in the worst style of British church architecture”. By 1885 matters came to a head and it was decided that a new church should be built. A number of wealthy merchants had moved into Woolton by this time and they agreed to support the building of the new church. The foundation stone was laid in 1886 and it opened for worship on 31st the following year. The old church was taken down stone by stone and reassembled in the Toxteth district of Liverpool. The new church was built from local sandstone in the so-called perpendicular style developed in the late 15th century. The 90-ft high bell tower contains 8 bells and is the highest point in Liverpool with commanding views of Lancashire, Cheshire and the Welsh hills. Inside the building are many fine features and seating for almost 500 people. 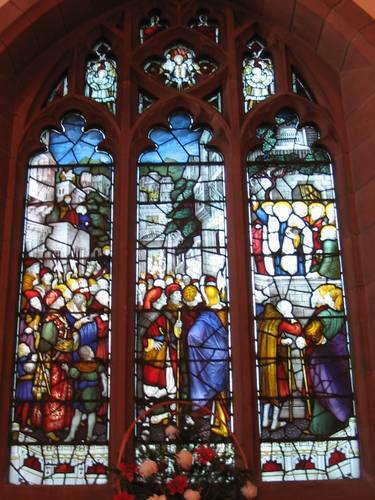 The church has a fine set of stained glass windows all except two of which are designed by the famous artist Charles Kempe. The two smaller windows were removed from the original church and are designed by William Morris. Kempe’s work can be seen also in the small side chapel, which is regularly used for smaller services. It is a magnificent building and one of the larger parish churches in Liverpool. However the church is about people and to celebrate and thank God for 100 years work and worship in the buildings, a new addition the church, the Centenary Rooms, was completed in 1987. This additional facility has enhanced the splendour of the building and can be used for families in modern day worship. As befits the building, St Peter’s church today is a lively and flourishing church proclaiming and bearing witness to the people around about Jesus Christ and the God who loves them. The original instrument was built by Foster and Andrews of Hull in 1895 not long after the completion of the church. It was rebuilt in 1945 by the Liverpool company Rushworth and Dreaper. The organ was refurbished and brought up to date with computerized coupling in 1994 by another Liverpool company David Wells – the company which tunes and maintains the instrument on a regular basis now. It is a relatively large instrument for a parish church and we are fortunate to have an organ of such good quality. It consists of three main sections, the Great, the Swell and the Choir, each of which has its own manual (or keyboard), and also a pedalboard. There are 38 stops, each of which produces its own distinctive sound. These can be combined (or coupled) to produce different blends of sound and a range of volume. Altogether there are 2338 pipes varying in length from a fraction of an inch to 16 feet. During regular services the organ generally accompanies the more traditional hymns. Before and after services a wide variety of music is played depending on what sort of service is taking place and on the season of the Church Year. Most of the music played is originally written for the organ but it is sometimes orchestral music arranged for organ.